Sylvain Chavanel (IAM) finally took a big classics win on the WorldTour when he won today’s GP Ouest France-Plouay in impressive fashion. Having bridged the gap to a late breakaway with 2km to go, the Frenchman showed off his great sprinting skills by holding off surprise runner-up Andrea Fedi (Neri Sottoli) and Arthur Vichot (FDJ) to take the biggest win for his IAM team. With wins in races like Brabantse Pijl and Dwars door Vlaanderen, Sylvain Chavanel has been knocking on the door for a big classics victory for a few years. Today he finally broke his drought when he took an impressive victory in a very animated edition of the GP Ouest France-Plouay. Chavanel went into the race on the back of a dominant overall victory in the Tour du Poitou-Charentes but had played down his expectations for the Breton race which often comes down to a sprint from a reduced peloton. The big favourite was Alexander Kristoff (Katusha) and it was no surprise that Katusha tried to control the race all day. However, several teams, most notably a very aggressive Omega Pharma-Quick Step, had different plans and they launched several attacks to put the Russian team under pressure. A very strong group with Michal Kwiatkowski (Omega Pharma-Quick Step), Tim Wellens (Lotto Belisol), Lars Petter Nordhaug (Belkin), Kristijan Durasek (Lampre-Merida), Ben Hermans (BMC), Christopher Juul (Tinkoff-Saxo) and Angelo Tulik (Europcar) escaped in the finale and with less than 10km to go, they were still 30 seconds ahead. Katusha had to chase hard and were on the limit at the bottom of the final climb with 5km to go. Here several attacks were launched and at the top a 20-rider group had brought back the 7 escapees. From here new attacks were launched and Cyril Gautier (Europcar) initiated the decisive move. He was joined by Arthur Vichot, Wellens, Julian Alaphilippe (Omega Pharma-Quick Step) and Hermans and later Chavanel and Andrea Fedi managed to bridge the gap. Katusha managed to catch the rest of the 20-rider group but with 1km to go, it was clear that the break would stay away. A few attacks were launched but the 7 riders were together when Hermans launched a long sprint. 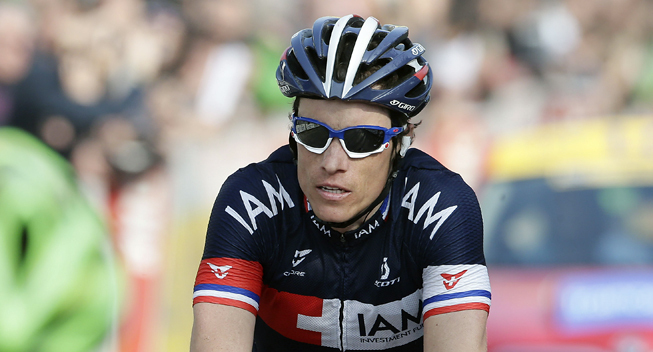 Chavanel found himself in the perfect position and he easily passed the fading Belgian when he put down the hammer. Fedi did his best to hang onto his wheel while the rest of the group was easily distanced. Chavanel had plenty of time to celebrate the victory while Fedi took an impressive second place ahead of Vichot. A few seconds later, Kristoff beat Giacomo Nizzolo (Trek) in the sprint for 8th. The WorldTour one-day racing resumes in two weeks when the GP Quebec and GP Montreal offer some hard circuit races that are perfect preparation for the World Championships. The series of autumn classics in Europe continue on Saturday with the Brussels Cycling Classic and on Sunday with the GP Fourmies. The GP Ouest-France Plouay followed its traditional format as most of the 229km race took place on the well-known 28.9km circuit on the northern outskirts of Plouay. However, the organizers had made a slight modification as 8 laps of the circuit were followed by one lap of a shortened circuit that included both major climbs. The final ascent, the Cote de Ty-Marrec, summited just 4km from the finish. The race got off to a fast start with several attacks as the riders left Plouay in beautiful sunny conditions and it took some time for the early break to be established. Finally a 5-rider group was formed when Michel Koch (Cannondale), Pierre-Henri Lecuisinier (FDJ), Jean-Marc Bideau (Bretagne), Stefano Pirazzi (Bardiani) and Kevin Van Melsen (Wanty) took off. The quintet managed to build an advantage of 7 minutes but unsurprisingly, Katusha and Orica-GreenEDGE decided to take control of the situation. Those two teams combined forces to gradually bring the gap down and with 85km to go, the escapees were only 3.50 ahead. Luke Durbridge did much of the early work for the Australian team but when the peloton hit the Ty-Marrec with 72km to go, he got the chance to take a rest. OPQS started to tighten the screws when Thomas De Gendt hit the front and his fast pace had brought the gap down to 2.45 at the next passage of the finish line. Valerio Agnoli (Astana) launched an attack on the first climb of the circuit but was caught by an impressive De Gendt who continued to work hard. He got some assistance from Astana who also wanted to make the race tough. The attacking had now started as Pirazzi launched the first move but it was the counterattack by Koch that worked. The German managed to build a 20-second advantage but when the chasers started to work together, they brought Koch back. While De Gendt and Mattia Cattaneo (Lampre-Merida) set the pace, Agnoli made another futile attempt to break clear. Moments later, Van Melsen attacked and he dropped his four companions. The chasers were brought back with 47km to go while Van Melsen was 25 seconds ahead as they hit the Ty-Marrec agin. Alaphilippe launched a fierce attack that created a small group with the likes of Kwiatkowski, Gianni Meersman and Yoann Offredo (FDJ). Kwiatkowski launched a solo attack after the group had caught Van Melsen and he crossed the line with a small advantage over a chase trio that included Michael Hepburn (Orica). An Ag2r rider bridged to the chaser but with 39km to go, they were brought back. Instead, Tulik, Hermans and Juul attacked and they bridged across to Kwiatkowski. Later Nordhaug, Wellens and Durasek also made the junction and with 32km to go, they were 25 seconds ahead. While Trek led the chase, they managed to increase their advantage to 45 seconds. Trek stopped their work and left it to Orica and Katusha to set the pace, with Damien Howson and Aliaksandr Kuchynski doing all the work. They were joined by Jasha Sütterlin (Movistar( and those three riders brought the gap down to 30 seconds. At the bottom of the Ty-Marrec climb, Katusha was the only team working and now new attacks were launched. Offred, Jesus Herrada (Movistar) and Stig Broeckx (Lotto) kicked off the action but they were brought back. Instead, Herrada, Enrico Gasparotto (Astana), Edoardo Zardini (Bardiani) and another Bardiani rider got a gap. Manuel Mori (Lampre), Edvald Boasson Hagen (Sky), Jan Bakelants (OPQS), Marcus Burghardt (BMC), Offredo, Nicolas Roche (Tinkoff), Armindo Fonseca (Bretagne), Michael Albasini (Orica) and a rider from Ag2r joined the group while Katusha chased hard. At the penultimate passage of the line, they were 35 seconds behind the escapees and now Bardiani lend the Russian team a hand. On the first climb on the small circuit, Bardet, Herrada and Albasini attacked. They were joined by Gasparotto, Bakelants, Mori, Fonseca and later by Reza. While Wellens launched an attack from the front group and was joined by Nordhaug, Kwiatkowski and Tulik, Dylan van Baarle (Garmin) passed the chasers. Reza joined him but Latisha borught them back. The front septet found back together while Bardiani, Orica and Katusha were chasing hard in the peloton that was 30 seconds behind with 30 seconds to go. Wellens and Hermans launched the next attack but it was Tulik who got clear on his own. BMC took over in the peloton and Marcus Burghardt led the peloton onto the Ty-Marrec for the final time. Here Nordhaug launched a strong acceleration and he passed Tulik to crest the summit as the lone leader with Wellens as his nearest chaser. A Bardiani rider launched the first attack from the peloton but it was Bjorn Leukemans (Wanty), Francesco Gavazzi (Astana), Julian Alaphilippe (OPQS), Jan Bakelants (OPQS), Greg Van Avermaet (BMC) that strung out the group. Their hard acceleration created a 20-rider group that brought both Wellens and Nordhaug back. Roche launched the first attack but as he was brought back, Gautier made the decisive move. He was joined by Vichot and Hermans and later Alaphillippe and Wellens also made the junction. Chavanel and Finetto were the final riders to make it across and now the attacking started. Vichot launched the first move but like the attacks from Wellens and Alaphilippe, it was futile. Instead, it came down to a sprint and here Chavanel was clearly the strongest.